^ a b c Taffin, John. (September–October, 2005). “The .44 Magnum: 50 years young!”. American Handgunner. http://www.findarticles.com/p/articles/mi_m0BTT/is_177_29/ai_n14816284. ^ a b c d e f Frank C. Barnes, ed. Stan Skinner (2003). Cartridges of the World, 10th Ed.. Krause Publications. ISBN 978-0-87349-605-6. ^ a b Boddington, Craig. The Fabulous .44 Mag. Guns & Ammo. オリジナルの2006年03月26日時点によるアーカイブ。. https://web.archive.org/web/20060326043249/http://www.gunsandammomag.com/ammunition/fabulous_44_mag/. ^ a b c Garry James (June 2005). “A Big 50 For The .44”. Guns & Ammo. http://www.gunsandammomag.com/ammunition/fifty_101105/. ^ a b Bill Hamm (September 28, 2004). “Ruger Blackhawk .44 Magnum 'Flattop'”. GunBlast.com. http://www.gunblast.com/Hamm_44-Flattop.htm. ^ Terry Riebling (November 1996). “Taking the Bite Out of the Mighty .44 Magnum”. Performance Shooter. http://www.gun-tests.com/performance/nov96biteout.html. ^ Ballistics By The Inch .44magnum results. ^ Jamison, Rick (August 2000). “Ruger's All New .44 Deerfield”. Shooting Times. オリジナルの2007年09月27日時点によるアーカイブ。. https://web.archive.org/web/20070927212327/http://www.galleryofguns.com/shootingtimes/articles/DisplayArticles.asp?ID=38. 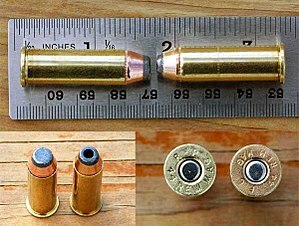 ^ Accurate Arms, 21.3 grains of #9 and an IMI 240 grain JHP bullet; see rifle and handgun data. ^ GGG Staff (October 1997). “.44 Magnums: Accuracy Problems Plague the Model 29”. Guns, Gear & Game. http://www.gun-tests.com/performance/oct97gggmagnums.html. ^ PS Staff (July 1997). “Stock Silhouette Revolvers: Anaconda Versus Redhawk”. Performance Shooter. http://www.gun-tests.com/performance/jul97silhouette.html. ^ Patrick Sweeney. “Reloading the .44 Magnum”. Guns & Ammo Handguns. http://www.handgunsmag.com/ammunition/44mag_081005/index1.html. ^ "Dirty Harry" Callahan character filmography.